As reported by Ethereum World News earlier today, Bitcoin (BTC) suddenly spiked straight out of left field. Within minutes, the cryptocurrency found itself above $4,200 after trading right under that resistance level for a number of days, even weeks. 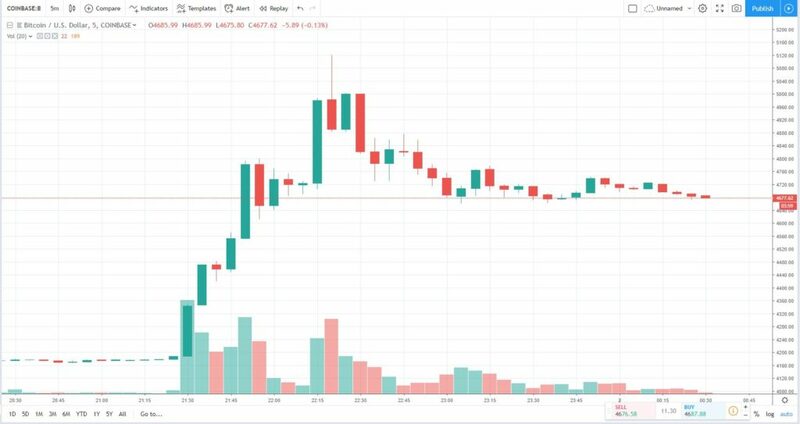 While BTC breached $5,000 for a brief period during Tuesday morning’s sudden spike, the market has since pulled back slightly to $4,650, as buying pressure has subsided from the Asian and European markets. However, some are hopeful that with the opening of the American trading session, investors across the pond of Europe on Wall Street will be subject to FOMO, thereby creating a second wave of buying pressure. It isn’t clear if this will occur, as some have postulated that this move was a result of always-on bots, but crypto investors across the board are rather hopeful. Save for a few soothsayers, this move caught many traders with their pants down. In fact, crypto Youtuber Sunny Decree recently joked that he recently made the “worst trade since [he] got on Youtube”, as he shorted $4,200. The fact is, there wasn’t a clear fundamental catalyst that drove this move. Sure, fundamentals for the ecosystem have recently been booming, with there being continual macro factors, institutional announcements, and technical developments that have been an underlying boon for the industry. But, many are sure that Tuesday’s move, which brought BTC from $4,150 to $4,650 — a move of ~14% — was a result of pure technicals. In response to a comment about the sentiment that CNBC is going to cover the crap out of this Bitcoin news tomorrow, industry trader The Crypto Dog explained that this move was simply price seeking liquidity. With there being relatively little volume, as seen by the lack of a large green candle below, this might not have been the ‘whale buy order’ that some looked to. And once $4,200 was breached, there was little friction in the order books in the mid-$4,000s, in spite of there being important resistance zones in that region. Thus, a short squeeze, or “cascading liquidations” as The Crypto Dog called it, perpetuated Bitcoin’s brief spike to $5,000+. Crypto Quantamental expressed a similar sentiment, but with a more bullish tone. He explained that the move was simple, with there being weeks of consistent gains, a clear move to test the $4,200 resistance, a declining long-short ratio, and massive “air” above $4,200 to drive the move. All this came together for a monumental 15% pump — the first of its kind in months. As a result of this move, crypto investors have been over the moon. Jeet Sidhu joked that “life is good” minutes after BTC started to rally. WhalePanda posted a cheery “Anchorman” GIF as BTC surmounted $4,600. And by and large, cryptocurrency stakeholders expressed buoyant sentiment, as they realized that the market could finally begin a recovery.